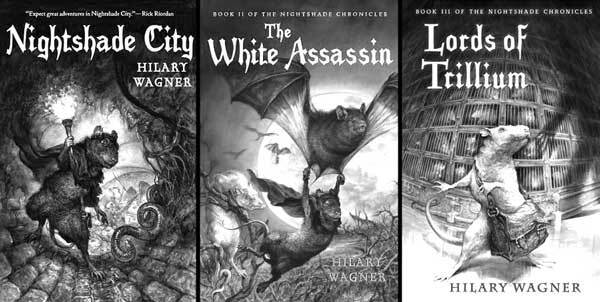 The third volume of the Nightshade Chronicles (Nightshade City, 2010; The White Assassin, 2011) is as entertaining as it is satisfying. To readers’ surprise and eventual delight, former uber-villain Billycan is the hero of this installment. Released from the control of malevolent and manipulative humans, he atones for his past misdeeds by arriving in Nightshade City just in time to help save it from an evil that has been brewing within. Next, feisty Billycan helps the Nightshade rats track down some of their number who have disappeared, most likely into the clutches of scientists resuming their dreadful experiments. What the brave explorers find will give them answers to many of the questions that have surrounded their existence—namely, what makes these rats superior to others, and what do the humans want from them? There’s not as much character development here as in the earlier books, as this volume is dedicated to unraveling big mysteries and tying up loose ends. In fact, there’s so much going on that if it’s been a while, readers may need to return to the first two volumes to make sense of the overarching narrative strands. But who will mind? Fast-paced and full of intrigue, this is one fantasy lovers won’t want to miss. Vincent and Victor Nightshade live in the underground rat city known as the Catacombs, home to unusually long-lived and intelligent rats. Their father, Julius Nightshade, was once a leader of the city, but now the evil High Minister Killdeer and his vicious helper, Billycan, have taken control and terrorize its inhabitants, demanding food as tribute and forcing orphans to serve in their army or kitchens. When Vincent and Victor try to escape Killdeer's clutches, they meet Juniper Belancort, a friend of their father, who now leads the resistance against Killdeer. Along with Juniper's niece, Clover, they are drawn into the struggle to free the rats from Killdeer's reign and bring them to a new home, Nightshade City. The three help develop a plan for the rebel rats and their ally earthworms to tunnel into Killdeer's palace and confront him directly, leading to a variety of underground battles. Wagner has created an atmospheric and action-filled tale, and her balance of strong male and female protagonists is appealing. Fans of Erin Hunter's "Warriors" books (HarperCollins) may enjoy the animal action and touch of romance, and the authentic rat and earthworm abilities add to the strength of the story. Fans of Suzanne Collins's Underland Chronicles and Brian Jacques’s Redwall series will enjoy this fast-paced adventure set deep in the Catacombs, where a community of intelligent rats lives in peace and harmony. Or at least they did, until two vicious rats, Killdeer and Billycan, led a coup that turned the democratic society into a dictatorship and its citizens into mistreated and oppressed subjects. Underneath all this misery, however, there is hope. A gang of rebels is creating a new city and welcoming refugee rats into its safety. The fate of the new city rests heavily on three orphans, brothers Victor and Vincent and Clover, a young female who has been secretly educated despite Killdeer's strict rule against educating girls. Can they help the rebels overthrow the tyrants, and can they do it before poor Clover is married off to Killdeer? The themes of love, loss and loyalty resonate through the novel, and the moments of darkness and violence are ultimately overpowered by hope and redemption. A good story well-told.